The Crandall Lab is in charge of uploading and curating animal studies for the AVAToL-Open Tree project. Chris Owen, postdoctoral researcher, has been leading this portion of the project for the animals beginning in March 2013. To date, the Crandall Lab has contributed over 400 studies and sent requests for over 100 studies for authors to contribute their phylogenies to the Open Tree project. Similar to the Solitis Lab group, the Crandall Lab success rate for obtaining published phylogenies directly from authors has been rather low. As a result, many animal lineages are currently represented in the Open Tree as taxonomic graphs. One example of a poorly sampled group is the decapods (crabs, crayfish, lobsters, prawns, and shrimp). Dr. Keith Crandall has studied decapods most of his career and his phylogenies generate a well-sampled backbone, but each higher taxon is represented by few species. Many researchers want to use the tree for some downstream analysis that benefits from sampling all species; therefore, at this stage of the project one must ask, “How can I obtain a phylogeny of all species for my favorite group, if the only thing available in Open Tree is a well-resolved backbone, while lower taxonomic ranks are represented primarily by unresolved taxonomic graphs?”. Recently, a paper was published in the journal Nature that may present a workaround for people who wish to obtain a mostly bifurcating comprehensive phylogeny, although only a bifurcating backbone is available on OpenTree. The published study by Jetz et al. 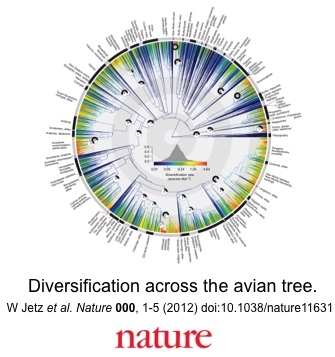 (2013) aimed to use a phylogeny of birds to explore changes in speciation and extinction rate through time, while also mapping all bird diversity, to gain insight into bird evolution. In order to explore these characteristics of bird evolution, the authors first needed a phylogeny of birds that included all species. However, no such phylogeny has ever been published and the most comprehensive bird phylogenies available at the time of the study did not contain all species for each crown clade. Their solution to generating a phylogeny of all birds began first by assigning each avian genus to a crown clade represented in the backbone phylogenies. Next, sequence data for a set of loci for each species in a crown clade was downloaded from public databases and the phylogeny was estimated using Bayesian inference. Since the crown clades of the backbone tree contain taxa also in the newly estimated crown phylogenies, the newly estimated crown phylogenies were sub-sampled with the backbone phylogenies to generate a pseudo-posterior distribution of complete avian phylogenies, which was used to depict the avian phylogeny with all species for downstream analyses. As the organismal labs continue to track down studies and wait for requested published phylogenies, a method such as this may be a temporary solution to obtain mostly bifurcating phylogenies for lineages not well-represented by source trees. Furthermore, variations of this theme could also be used. For example, one could estimate a single tree for each crown clade and merge each tree with the Open Tree phylogeny that has a well-resolved backbone that has unresolved recent clades, using Open Tree Software, and ultimately create a synthetic tree for your favorite group. These are a couple of potential methods to generate comprehensive phylogenies using the Open Tree for poorly resolved lineages represented only by taxonomy and we look forward to new ideas other researchers offer once the tree becomes public. Keith Crandall is a professor and director at the George Washington University Institute of Computational Biology. Chris Owen is a post-doctoral researcher for the AVAToL grant at George Washington University.